This week we have a review of the new Daniel Rinaldi mystery by Dennis Palumbo, as well as a giveaway of the book-details at the end of this post. Dennis will be doing a writing workshop at Mysterious Galaxy Redondo Beach, 2810 Artesia Blvd., Redondo Beach, California, on May 25 at 2:30. Bring your questions and your notebooks as Dennis answers questions in this informal writer’s workshop, Taking the Mystery Out of Writing Mysteries. 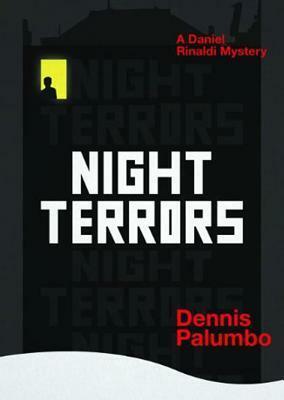 Dennis, a licensed psychotherapist and former Hollywood screenwriter, will also be signing and discussing Night Terrors, the third entry into the Daniel Rinaldi Mystery series. Also at the end of this post is a link to purchase a copy of the book from Mysterious Galaxy if you can’t be at the signing. If you order before the event you can ask for a signed copy. What they find is a grotesque sight; a snowman, topped not by a snowball, but by Ed Meachem’s severed head. This would be a gruesome case quickly closed and best forgotten were it not from a plea from Currim’s mother, claiming that she has proof of his innocence and begging Rinaldi to help her secure his release, and uncover why Wes would have falsely confessed to murder. Even as Rinaldi struggles to separate himself from that case he is unwillingly drawn into a rampage of revenge being carried out by the “Biggest Fan” of a serial killer. After John Jessup was beaten to death by a guard during a prison riot, the guard responsible for the beating, as well as the judge who sentenced Jessup, was shot to death in what is not believed to be a coincidence. The FBI have placed the profiler responsible for helping catch Jessup, John Barnes, in protective custody, but his uncontrollable fits of “Night Terrors” have them calling Rinaldi for help. A man who has seen far too much of the most horrifying of cruelties people can inflict upon on another, since his retirement and especially since Jessup’s death, Barnes has been experiencing nightmares so terrifying that the agents guarding him are unsettled. Particularly difficult in treating night terrors is that, despite the alarming screams and nightmares, those who suffer from them are often unable to remember anything about their dreams. However, before Rinaldi and Barnes can do much exploration into this fascinating realm of night terrors, Barnes escapes from protective custody and unfortunately places himself on the very short list of suspects. Rinaldi’s sense of obligation and admiration for the profiler have him unable to give up pursuing the man’s trail, despite the FBI’s adamant declarations that the psychologist’s services are no longer needed. Rinaldi is immersed in two investigations that cross numerous police departments and where the killer is always two steps ahead, with too much insight into the law enforcements’ activities. As a clinical psychologist, Rinaldi treats patients who have been traumatized by violence and face the difficulties of coping with the resulting fear, helplessness, shame, and survivor’s guilt. These are symptoms Rinaldi is well acquainted with, as having been an amateur boxer he still feels that he should have been able to protect his wife from a mugger’s the fatal gunshot. Rinaldi eventually pulled himself out of his depression and trauma by devoting himself to helping others suffering from the same fate, and led to his becoming a consultant for the Pittsburgh police. Although Rinaldi still mourns for his wife he has begun a very tentative relationship with Detective Eleanor Lowrey, a beautiful African-American woman, whose obligation to her family is as much as obstacle as their professional alliance. The action never stops in this psychological thriller, populated by well-described, elaborate personalities with even more complicated motives. What the author ably crafts characters so realistic, that the reader truly feels invested in their fates and mourns those who are victimized. The brutality of the violence is always balanced by the wit and humor of Rinaldi’s narrative, making this a thoroughly enjoyable read with a very complicated plot and just as satisfying conclusion. To enter to win a copy of Night Terrors, simply email KRL at life@kingsriverlife[dot]com by replacing the [dot] with a period, with the subject line “Night”, or comment on this article. A winner will be chosen May 25, 2013. U.S. residents only. Check out other mystery articles, reviews, book giveaways & short stories (including Dennis’ Smart Guys mysteries) in our mystery section. I agree. This does sound very intriguing. This does indeed sound very interesting. I have just finished an incredible mystery by Jonelle Patrick, Fallen Angel and I am ready to dive right onto another one so been digging through review trying to find a good one and this may just fit the bill! Info on Jonelle’s book is on her site jonellepatrick.com if anyone wants a good recommendation. Thanks for this review!